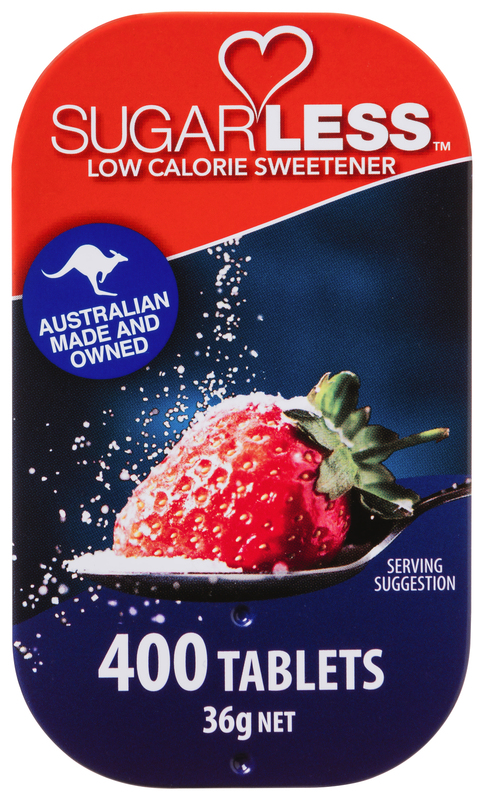 Our range of low calorie sweeteners are a great sugar substitute. They taste and sweeten like sugar, minus the calories! SUGARLESS® Sweetener is perfect for anyone trying to lose weight or anyone deciding to live a start a sugar free diet, in combination with a healthy diet and regule exercise. Is diabetic and vegan friendly, as well as gluten free. 1. Sugarless Sweetener Powder Sachets, 60's. Shop this item now. A handy 60 individually wrapped sachets pack to use in your kitchen, a cafe, or work. Super convenient. Easy to use. Keep them on you. 1 sachet = 2 level teaspoons of regular sugar. 2. Sugarless Sweetener Powder Sachets, 110's. Value pack of individually wrapped sachets provide ease of use and convenience. Use it in your coffee, tea, juices, or smoothies. 3. Sugarless Liquid Sweetener, 250ml. Sugarless® Liquid comes in a ready to use, easy to measure bottles. Make cakes sugar free. Great for baking or cooking. Use in treats, desserts, stir fries or sauces, with only a fraction of the calories. 4 drops = 1 level teaspoon of regular sugar. 4. Sugarless Sweetener Cafe Sticks, 50's. Sugarless Cafe Style Slims comes in stylish sticks perfect for a morning or afternoon beverage. With 50 sachets in a pack, you can keep it at home or take it with you to a cafe. 5. Sugarless Sweetener Tablets, 400's. Sugarless Sweetener tablets are available in a compact, slide container that makes convenience wonderful. Simply slide the lid down, tip container until tablet comes out, and slide back up when finished. Keeps tablets fresh and tasty. 1 tablet = 2 level teaspoons of regular sugar. 6. Sugarless Sweetener Caterer, 1000's . Shop this item now.